Seeking our purpose in this world can be a significant driving factor in our lives. Here are specific steps to help find purpose. 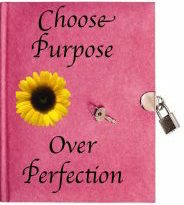 Even though understanding our purpose is a goal many aspire to, we live in a time where perfection is highly valued. Have you ever set a goal and taken steps to achieve it only to end up feeling shut down by your own inability to get it just right? It’s a common struggle — needing to do things flawlessly in order to feel like you’re making progress or experiencing success. Boy, have I been there! 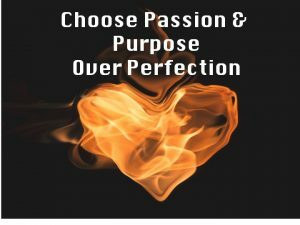 Perfection is a myopic trap, leading to the belief that it alone equates to success or even to your worthiness of love and acceptance. But perfection is unattainable and the truth of this becomes discouraging — at times paralyzing. What purpose do my goals serve? What compelling emotion blazes in my spirit when I imagine its outcome? If you’re coming up short on answers then your goals may not be aligned with what you truly need to be focused on. Choose to set and achieve your goals with a deeper understanding of their purpose and the pathway to reach them becomes clear. Purpose ignites your motivation and fuels that drive toward consistent action, plus it allows you to not only enjoy the process, but also become an active participant in your life as you navigate the best course toward your success. Passion makes everything seem effortless. Even though effort and attention are always required, passion imbues everything we do with a sense of ease, as if everything is falling into place exactly when and where it is supposed to be. And when roadblocks appear — because, trust me, they will — they no longer lead to discouragement since passion illuminates possibilities that were once only recognized as limitations. Make some shifts in how you achieve your goals starting today — you will be amazed at how fast your dreams are met, even exceeded, when you’re fueled with passion and purpose every step of the way! P.S. Here are even more ways to put purpose into practice in your life!